The grey, foggy weather matched the minds of many Iowa City residents the morning after President Donald Trump’s inauguration. 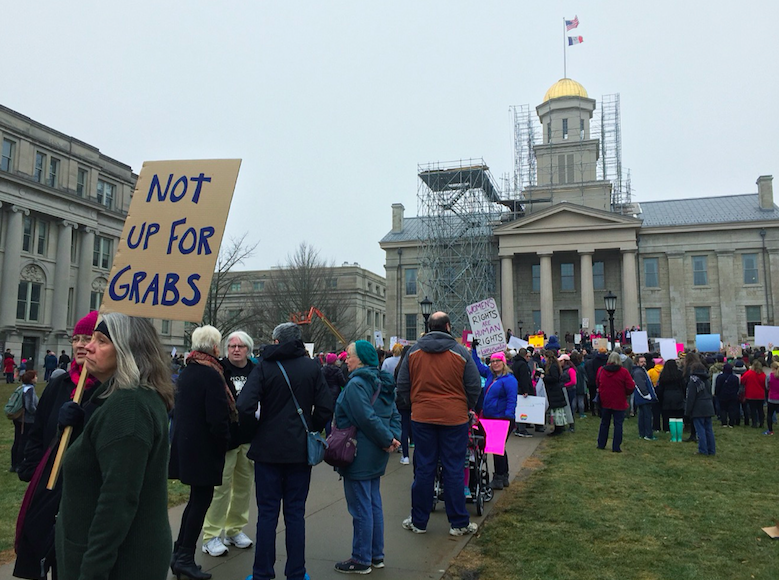 Across the world, women’s marches broke out to advocate for women’s rights, and Iowa City, Iowa was a strong participant. The local march began at noon as protectors of rights gathered at the University of Iowa Library, taking a moment of silence for solidarity. After a two-minute break in the chaos, “Let’s get rowdy,” was shouted by Director Corey Hickner-Johnson. West High Students show their support for the LGBT+ community. With that goal on their minds, the one thousand-some participants slowly marched to the Old Capitol, chanting and smiling all the way. The sheer volume of the event caught the attention of many passing by. Junior high students Maddie and Lucy speak their minds through words. The unease observed by those on the sidelines was expressed by one central concern among those marching- civil rights. “We believe in rights and we believe that our new president is not giving us those,” said Southeast junior high students Maddie and Lucy. Others not only marched for their rights, but for acceptance and love. 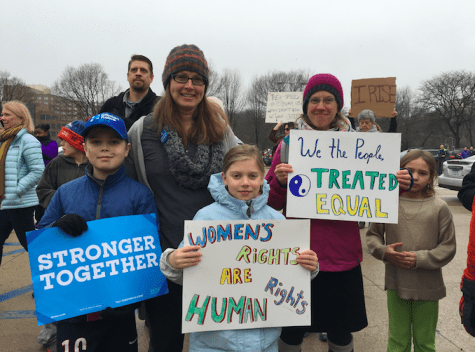 Iowa City resident Erin stands with her family and friends at the start of the march. That message, many believe, was effectively spread.